Waste disposal issues in New York did not emerge only since the 1950s. Contemporary residents of the New York metropolitan area would be surprised to learn that public policy debates related to waste disposal and water pollution issues began only a few decades after colonial settlers arrived in the New World. The early settlers' practice of simply dumping pails of sewage and other refuse into the harbor became such a problem that, in 1680, the Governor ordered that a common sewer be constructed in Lower Manhattan. In 1683, the Common Council decreed "that none doe cast any dung, drought, dyrte or any other thing to fill up or annoy the mould or Dock or the neighborhood near the same, under the penalty of twenty shill" (Gross, 1976). Construction of a sewer and wastewater collection system in New York City began in 1696, with many sewers in lower and central Manhattan constructed two centuries later between 1830 and 1870 (O'Connor, 1990). Pollution problems existed, however, in both New York City and Newark, New Jersey, since the harbor received untreated wastewater from the sewers. In 1868, unsanitary conditions were described as "poisoning the water and contaminating the air" (Suszkowski, 1990). During the 1920s, the overpowering stench of hydrogen sulfide from polluted water in the Passaic River near Newark, New Jersey, forced excursion boat passengers to seek refuge in the cabins (Cleary, 1978). During that period, all the regional New York and New Jersey communities discharged raw sewage into the harbor "to conduct by the cheapest route to the nearest waterway, giving no thought whatever to its effect on the waterway and on adjacent waters" (Franz, 1982). In the 1920s, New York City discharged approximately 600 mgd of raw sewage into the harbor (Brosnan and O'Shea, 1996a). The earliest water pollution surveys of New York Harbor began with the formation of the Metropolitan Sewerage Commission of New York in 1906. In a 1910 report on conditions of the harbor, the Commission stated that "Bathing in New York Harbor above the Narrows is dangerous to health, and the oyster industry must soon be entirely given up." The Commission further noted that a number of tributaries and tidal channels in the harbor "have become little else than open sewers. Innumerable local nuisances exist along the waterfront of New York and New Jersey where the sewage of the cities located about the harbor is discharged " Finally, the Commission concluded that "the water which flows in the main channels of the harbor... is more polluted than considerations of public health and welfare should allow" (Suszkowski, 1990). 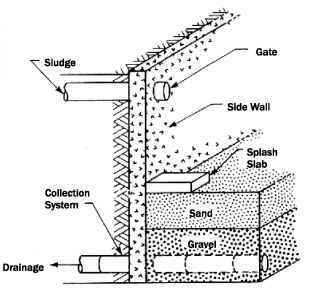 As with many other urban areas around the turn of the twentieth century, development of a combined drainage network for stormwater and sewage collection evolved to address public health problems resulting from inadequate methods of waste disposal that created a nuisance in the streets and contaminated groundwater supplies (Fuhrman, 1984). With vast marshlands, embayments, and interconnecting tidal channels, New York Harbor once supported abundant populations of fish, shorebirds, and shellfish that were important local food resources and essential to certain commercial activities. The progressive decline of the once thriving oyster industry provides an important ecological indicator of the trends in environmental quality of New York Harbor. Commercially important oyster beds were harvested during the 1800s in Raritan Bay, the Kill Van Kull, Jamaica Bay, and Newark Bay, and in the Shrewsbury River. By the turn of the twentieth century, waste disposal from industries and towns began to seriously affect the survival of seed beds. In addition to industrial waste and sewage discharges, dredging and disposal of dredge spoils, illegal dumping of cellar dirt, street sweepings, and refuse all contributed to the demise of this once valuable estuarine resource. Although a century of pollution, disruption of habitat, and mismanagement of seed beds all contributed to the decline of oyster abundance, bacterial contamination from raw sewage disposal was the catalyst for the death of the commercial oyster industry. As early as 1904, typhoid cases were linked to consumption of contaminated oysters. By 1915, 80 percent of the city's 150 typhoid cases were attributed to contaminated oysters harvested from the harbor. In 1924 and 1925, another major outbreak ocurred, even though many of the beds had been closed in 1921 because of public health concerns (Franz, 1982). More than three decades later, consumption of sewage-contaminated hard clams from Raritan Bay again resulted in serious public health problems with an outbreak of infectious hepatitis in 1961. Oysters, however, were not the only natural resource to suffer serious depletion of once-abundant stocks. In the closing decades of the nineteenth century, pollution and habitat destruction had begun to seriously degrade water quality and affect the abundance of marine resources. A century-long record of commercial fishery landings for New York and New Jersey clearly documents the adverse impact of water pollution and habitat destruction on the rich natural resources of the estuary (Esser, 1982). Combined landings of important estuarine and anadromous species, such as shad, alewives, striped bass, sturgeon, American oysters, hard clams, and bay scallops, have declined 90 percent over the past century, from 58 million pounds in 1887 to 6.6 million pounds in 1996 (McHugh et al., 1990; Wiseman, 1997) (Figure 6-6). 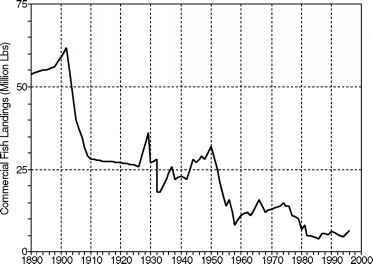 In interpreting this long-term trend, it is important to realize that, even a century ago, resource abundance was already considered depleted in comparison to reports of abundance recorded through 1850. Contemporary degradation of the resources of the estuary, marked by successive anthropogenic assaults and incremental improvements in waste-water treatment, is believed to have begun as early as 1870 (Carriker et al., 1982). Figure 6-6 Long-term trend of commercial landings of major anadromous and estuarine species in New York Harbor. Sources: McHugh et al., 1990; Wiseman, 1997.
included severe oxygen depletion and closure of shellfish beds and recreational beaches due to bacterial contamination. More recently, nutrient enrichment, algal blooms, heavy metals, sediment contamination, and bioaccumulation of toxics, such as polychlorinated biphenyls (PCBs) in striped bass (Faber, 1992; Thomann et al., 1991) and bald eagles (Revkin, 1997), have also become issues of concern. By the 1920s, summer oxygen within much of the harbor had deteriorated to critical levels of less than 20 percent saturation (Brosnan and O'Shea, 1996a). Along with oyster industry records, long-term DO records document a progressive decline in the environmental quality of the harbor from 1910 through about 1930, as a result of increased population growth and raw sewage loading to the harbor (Brosnan and O'Shea, 1996a; Wolman, 1971). Following a period of very low oxygen saturation from about 1920 through 1950, the subsequent increasing trend generally corresponds chronologically to incremental improvements in construction and upgrades of sewage treatment plants, beginning in 1938 (Brosnan and O'Shea, 1996a). With the completion of New York City's last two sewage treatment plants in 19861987, one of the major remaining water pollution problems in the harbor results from combined sewer overflows that discharge raw sewage and street debris. Following storm overflows, high bacteria levels require the closing of shellfish beds and bathing beaches. Although an aggressive industrial pretreatment program reduced the total industrial metal contribution from New York City plants from 3,000 lb/day in 1974 to 227 lb/day in 1991 (Brosnan et al., 1994), early ambient data still suggested violations of state water quality standards for metals in many locations of the harbor. More recent investigations conducted under the auspices of the NY/NJ Harbor Estuary Pro gram (HEP), indicated significantly lower metal concentrations, with harborwide ex-ceedances found only for mercury. Current monitoring and modeling efforts have greatly reduced the extent of waters suspected to be in violation of standards for nickel, lead, and copper (Stubin, 1997). Additional toxic chemical problems in the harbor are associated with PCB contamination of sediments and striped bass and other marine organisms, resulting from PCB discharges from two General Electric plants upstream of Albany from the 1940s through the mid-1970s (Thomann et al., 1991). With a commercial fishing ban imposed because of PCB contamination (Faber, 1992), the striped bass population is thriving to the extent that the abundance of contaminated bass caught in nets and then returned to the estuary is actually creating an economic hardship for the commercial shad fishery (Suszkowski, 1990). More recent state-of-the-art monitoring and analysis technologies have detected trace level concentrations of PCBs in regional sewage treatment plant effluents. Current track-down programs, again initiated under the auspices of HEP, seek to determine the sources of these PCB contributions to the municipal waste stream.